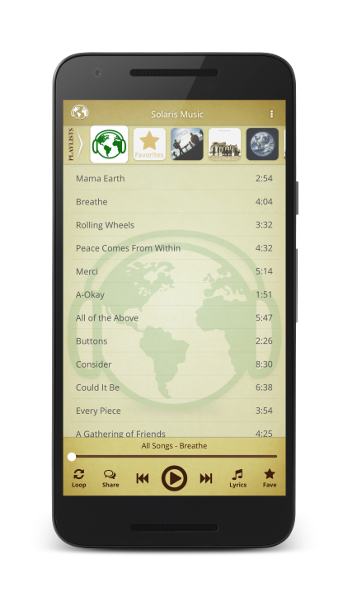 A free music streaming app for your smartphone that comes loaded with all of Solaris's music — plus videos, lyrics and more! Complete lyrics and chords to learn the songs yourself. Immediate access to new recordings the moment they are realeased. Build your own playlist of Solaris favourites. Offline mode with full features. No ads (unlike other free music apps). ¿Giving Away Good Music For Free? 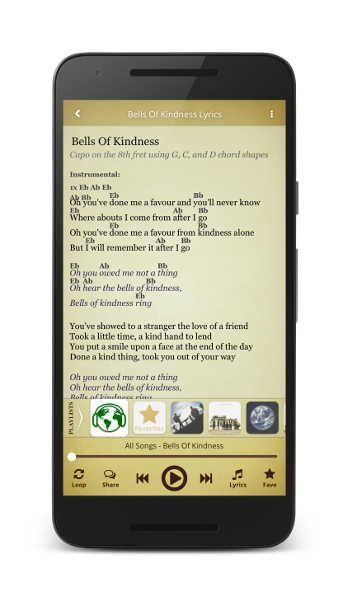 We built this app so that anyone could get access to (and learn to sing) this music. We are not on a mission to get rich or famous. We are on a mission to share good music! Money can be a barrier to good things, and we want to remove those barriers. That's why this app is free! Whenever we publish new music, including live tracks from concerts and new studio recordings, they are immediately available for free in the app. Our newest recordings are always at the top of the main playlist. Missed a word? Want to sing along? Lyrics for all the songs are built in to the app! Easily learn the songs yourself with hassle-free access to complete lyrics and chords, plus select instructional videos. Tap the at the bottom right to pull up lyrics for the current song. 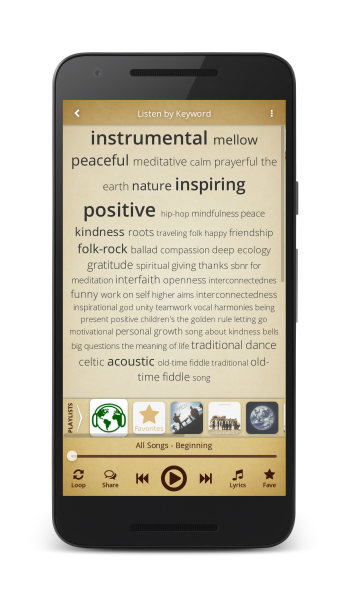 The app includes everything from folk ballads, to hip-hop, to Celtic dance tunes, to meditative synth soundscapes. 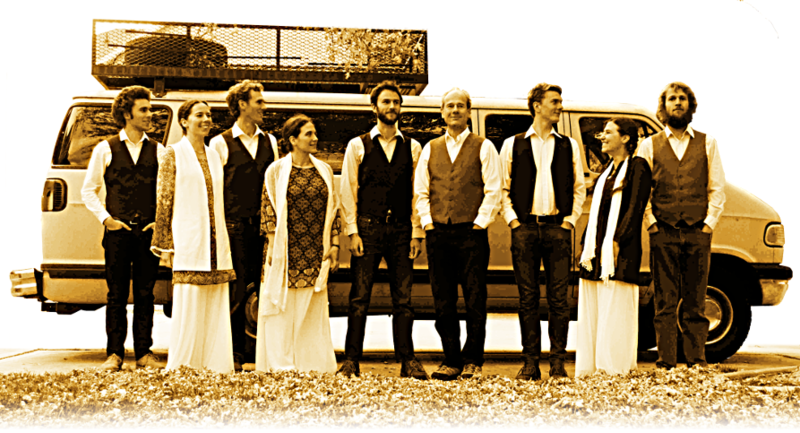 The build in search finds music that suites the moment. Tap the search icon to listen by mood or style. Listen to all your favorites with the custom faves playlist! Add a song to your favorites playslist by tapping the in the lower right corner (the star will turn white). Tap again to remove it (the star will turn brown again). 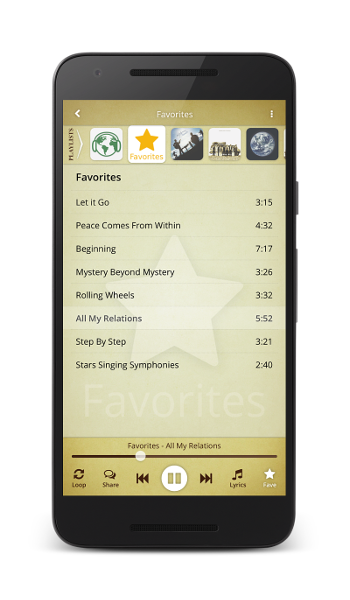 Once you've added some songs, tap the Favorites playlist to listen to your favorites. Music is made for sharing, and this app is made for sharing music! It easy to share your favorite song with friends in just three clicks. When you share music from the app your friends get a link that goes directly to the song that you're listening to, without them needing to install the app. Tap the share button to share the song or album you are listening to at the moment. 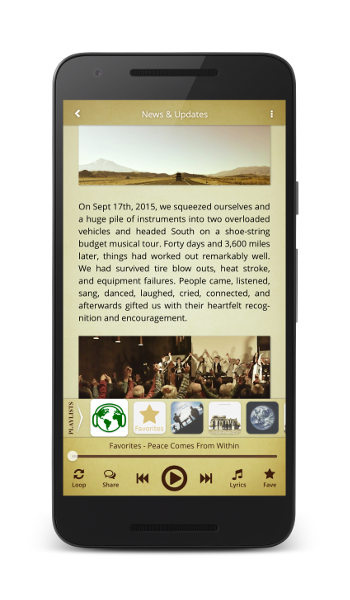 Be the first to know about tours and new music using the app's built in news channel. Tap News & Updates in the app menu to see what's new. The app includes some very early Solaris recordings. The musicianship and recording quality on some of these is obviously not up to our current standards, but we included them in the app because they are an authentic part of the process. 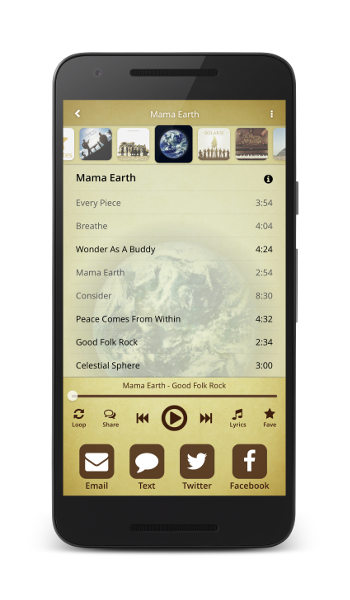 The app also includes other music created by the Solaris musicians including FM Studio recordings and music from The Merry McKentys. The main playlist includes all available songs in chronological order. 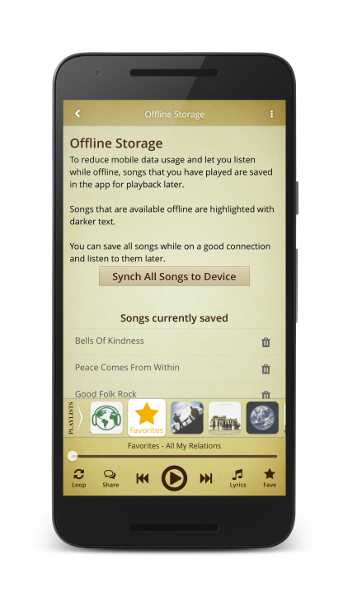 Or, open Offline Storage from the app menu (the at top right) and hit Save All Songs to Device while on a good connection (such as free WiFi), then listen to them offline later. Google Play and the Google Play logo are trademarks of Google Inc.	Apple, the Apple logo, iPhone, and iPod touch are trademarks of Apple Inc., registered in the U.S. and other countries. App Store is a service mark of Apple Inc.